One of the newest tourism destinations in Southern Africa has come alive. Mozambique has a beautiful (1,500 mile) coastline with abundant islands and picture perfect beaches and reefs. Mozambique’s wildlife is slowly recovering from several decades of civil war, its national parks offer stunning landscapes with increasing numbers of animals: Banhine, Zinave, Gorongoza and the Maputo Elephant Reserve. The coral reefs of Mozambique are some of the world’s richest, making the country a haven for snorkeling, diving and sun bathing. 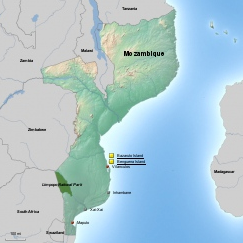 The cosmopolitan existence of Mozambique started well before the first Europeans arrived in the region. Arab sailors are thought to have been trading with Mozambique prior to 600 AD, bringing spices and architecture into the country. With the combination of Portuguese and Arab, as well as African influences, Mozambique offers one of the greatest combinations in culture and architecture on the African continent. Mozambique is a diamond in the rough offering simple pleasures in stunning surroundings. Location: Mozambique is located in south-eastern Africa, bordering South Africa, Zimbabwe, Malawi, Zambia and Tanzania. Size: Mozambique covers 309,475 square miles, slightly less than twice the size of California, or slightly larger than Turkey. Population: Around 24.5 million people live in Mozambique. Languages: Portuguese is the official language of Mozambique and widely spoken by around a third of the population. Over 40 indigenous languages are spoken throughout Mozambique, with Emakhuwa and Xichangana among the most common first languages. The Flag: The current Mozambique flag was adopted in 1983 and together with an open book (education) depicts an AK-47 with a bayonet attached, inside a red Marxist flag. It is the only flag in the world to have such a modern symbol of warfare! A new flag is likely in the near future, designs are already in place. Currency: The Metical (MZN) is the national currency of Mozambique, but at some of the luxury seaside resorts, the US Dollar or South African Rand is likely to be accepted. Getting to Mozambique: There are no direct flights from the US to Mozambique, the most efficient way to get there is to stop over in Johannesburg and fly into Maputo’s (MPM) International Airport (on SAA, Federal Air, or LAM), or to Vilanculos (VNX) if you are heading to the beach. There are several flights a week direct from the Kruger, Nelspruit (South Africa) to Vilanculos during the high season on Federal Air. The capital, Maputo, located to the south and formerly known as Lourenco Marques, evokes some the atmosphere of its Portuguese colonial past with its wide streets lined with acacia and jacaranda trees. The Cathedral, on Independence Square, is an imposing sight, as is the neo-classical City Council Chambers nearby. The gothic style Museum of Natural History houses exhibits on many of the animal species in Mozambique. The Fortress, one of Maputo’s oldest buildings, is now a colonial history museum. In the bay, about 20 miles from Maputo, is the lovely Inhaca Island, which is accessible by both boat and aircraft. Tours are organized to various parts of the island such as Ponta de Santa Maria or to Portuguese Island. Surfers seeking big waves will be drawn to Praia da Macaneta, which again can be reached by boat from Maputo. Beira is Mozambique’s second major port located at the mouth of the Pungwe River in the central region. In the heart of the city is the square of Largo do Munincipio, surrounded by old colonial buildings, terraces, tea rooms and shops. The cathedral, erected in 1925, was built partly from stones from the 16th century Fort of Sofala, which has since been submerged under the sea. Other buildings of note are Casa Portugal, built in typical colonial style, and the magnificent Casa Infante de Sagres. You’ll definitely want to spend some time in the lively markets – the Mercado do Maquino is famous for selling traditional potions used by local healers – and a visit to the shipwreck near the lighthouse is also worthwhile. Beira’s best beaches are found between the Cube Nautico and the lighthouse. Six Miles is a resort situated about 6 miles from the city center. It consists of an artificial lagoon with islands, where visitors can swim or hire pedal boats. One of the most popular tourist areas in Mozambique is the Bazaruto Archipelago consisting of four islands – Bazaruto, Benguerra, Margaruque and Santa Carolina. They are situated just off the mainland, but 470 miles from Maputo, and are accessible by dhow from the town of Vilanculos or by private air charter. Activities on the islands revolve around every form of motorized or non-motorized water sports including water skiing, parasailing, and wind surfing. Deep sea fishing expeditions, and rock, surf and fly fishing are also on offer. The Mozambique Channel is well known for its trophy sized marlin, kingfish and sailfish. Mako, wahoo, serra, yellowfin tunny and queenfish are also regularly caught. The archipelago’s coral reefs and clear waters are a magnet for snorkeling and scuba diving fans, where night and wreck dives are also offered. And the rugged terrain of the archipelago combined with its natural beauty, make it an ideal place for hikers. The Bazaruto Archipelago is a bird watchers paradise, with 164 different species identified. Benguerra Island alone is home to 115 different types including the rare crab plover, the olive bee eater, green coucal and narina troga. The varying habitats throughout Mozambique account for its incredible wealth of bird life with more than 900 species recorded. Marine life includes the most spectacular of marine mammals, the dugong, and several types of dolphin. Humpback whales can be seen during the summer months. Land animals include the small suni and duiker antelope, which have recently been re-introduced to the island.